Will Carl Icahn's winning streak continue? Shares of Icahn Enterprises are up more than 70% so far in 2013, a sign of the famed investor's success. To paraphrase Frank Sinatra, it has been a very good year for famed activist investor Carl Icahn. If the past two days are any indication, his new bet on Apple will pay off too. Shares of Apple (AAPL) have surged nearly 7% after Icahn disclosed Tuesday on Twitter that he has taken a "large" stake in the company. Apple's stock even traded above $500 on Wednesday for the first time since January. The latest regulatory filing from Icahn didn't include his stake in the company, which means he bought Apple during the current quarter. But Icahn's recent investments in other companies have been even more fruitful. 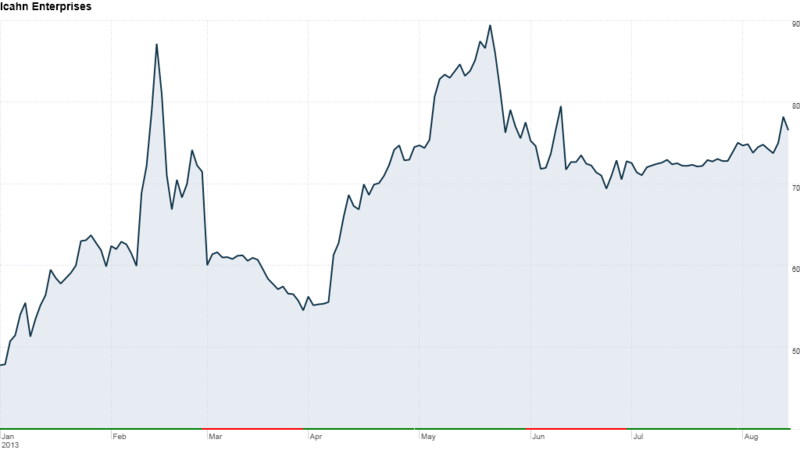 Shares of CVR Energy (CVI) have more than doubled since he first picked up a 14.5% stake in the company in January 2012. A few months later, Icahn essentially took control of CVR, boosting his stake to 80% of the company. CVR is Icahn's second largest holding. 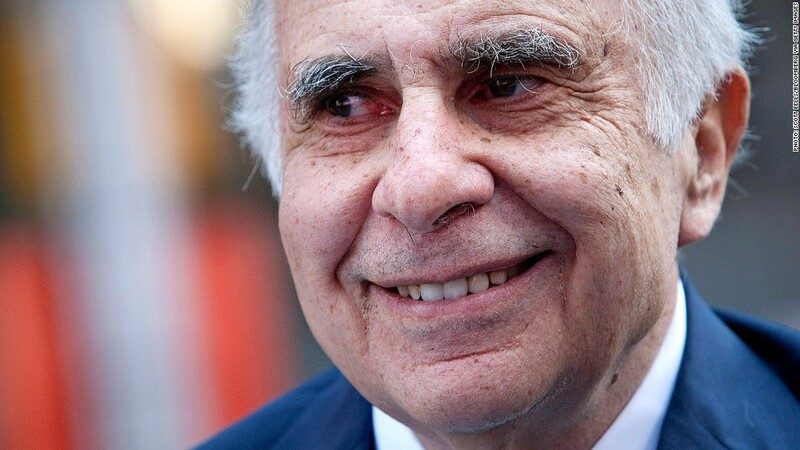 Only his stake in his own firm, Icahn Enterprises, is bigger. And that stock has been a huge success this year as well. Shares of Icahn Enterprises (IEP) are up nearly 80% so far in 2013. "Icahn is one of the greatest investors ever, and it's pretty well documented that he's having one of his best years," said Ken Squire, founder of the 13D Monitor and the 13D Activist Fund. One of his biggest winning bets this year has been on Herbalife (HLF), which pitted him against rival investor Bill Ackman of Pershing Square Capital Management. Ackman first revealed in December that he believed Herbalife was running a pyramid scheme and that he was shorting the stock. The following month, Icahn said his research proved otherwise, and in February, he announced he had bought a nearly 13% stake in Herbalife. Shares of Herbalife have more than doubled this year, and Icahn has since increased his position in the company. Icahn has also been a big winner thanks to his bet in Netflix (NFLX) -- even though you could argue that his reason for buying it was wrong. The billionaire took a 10% stake in the streaming video company in October because he thought it was undervalued and would be a good buy for larger companies who needed to build out their streaming services. But Netflix has surged more than 180% this year thanks to strong subscriber gains. Few are talking about the need for Netflix to sell the company now. Last month, Icahn said he considered selling his stake in Netflix earlier this year but sat tight at the urging of his son. Icahn is now thankful to Netflix CEO Reed Hastings, and has said that the gains in Netflix shares have generated more than $1 billion in paper returns for him. The billionaire hedge fund manager has also notched a win with his investments in Chesapeake Energy (CHK) and oil driller Transocean (RIG), in which he boosted his stake last quarter. More recently, Icahn has been in the headlines due to his battle with Michael Dell and private equity firm Silver Lake. So far, Icahn has been successful in warding off the company's founder and Silver Lake from taking Dell (DELL) private. Icahn, who owns nearly 9% of Dell, says he wants to keep the PC giant public and says he has CEO candidates in mind to run the company. Of course, Icahn hasn't always come out on top with his investment decisions. In August 2011, he gave up trying to take control of movie studio Lions Gate following a two-year-long battle. He sold his 33% stake at a price of $7 a share. At the time, Icahn broke even on his investment, but shares of Lions Gate (LGF) have nearly quintupled since then thanks to the huge success of the "Twilight" movie franchise and "The Hunger Games." So not even Carl Icahn can win all the time.